For the film director, screenwriter and producer, see Jonathan W. Stokes. Jonathan Stokes (c. 1755 – 30 April 1831) was an English physician and botanist, a member of the Lunar Society of Birmingham, and an early adopter of the heart drug digitalis. Stokes was probably born in Chesterfield, Derbyshire, around 1755 and studied medicine at the University of Edinburgh in 1778, qualifying as MD in 1782. He practised medicine in Stourbridge, Worcestershire, and also pursued interests in botany as a plant collector and cataloguer. Stokes became associated with William Withering (1741–1799), physician and botanist, who was a member of the influential Lunar Society. Stokes had dedicated his thesis on oxygen to Withering and became a member with him of the Lunar Society from 1783 to 1788. Stokes contributed to Withering's An Account of the Foxglove and its Medical Uses (1785), writing a preface on the history of digitalis and providing details of six clinical trials on patients he had treated for heart failure using Withering's pioneer method. He helped to disseminate medical knowledge of digitalis, lecturing to the Medical Society of Edinburgh on 20 February 1799. He was elected a Foreign Honorary Member of the American Academy of Arts and Sciences in 1788. Stokes collaborated with Withering on the third volume of the second edition (1792) of Withering's standard botanical text, The Botanical Arrangement of All the Vegetables Naturally Growing in Great Britain. Withering later fell out with Stokes (as he had with Erasmus Darwin), in a dispute over Stokes's role in the new edition. In 1790 Stokes was elected as one of the inaugural 16 associates of the newly founded Linnean Society of London and corresponded with Carolus Linnaeus the Younger. He spent the rest of his life in private medical practice in Chesterfield and pursued many scientific interests, publishing A Botanical Materia Medica: Consisting of the Generic and Specific Characters of the Plants Used in Medicine and Diet, with Synonyms, and References to Medical Authors (1812) and Botanical Commentaries (1830). He died in Chesterfield on 30 April 1831 and was buried at St Mary's, Chesterfield. The plant Stokesia cyanea or Stokesia laevis (Asteraceae/Compositae) is named after him. Stokes, Jonathan (1812). A Botanical Materia Medica. London: J. Johnson and Company. Stokes, Jonathan (1830). Botanical Commentaries. London: Simpkin and Marshall. ↑ Aronson, J. K. (ed) (1985). 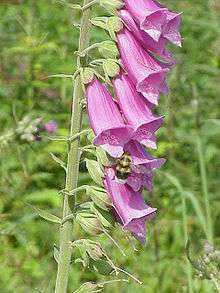 An Account of the Foxglove and its Medical Uses 1785-1985. Oxford University Press. p.286. ↑ "Book of Members, 1780–2010: Chapter S" (PDF). American Academy of Arts and Sciences. Retrieved 28 July 2014. Schofield, Robert E. (1963). "The Lunar Society of Birmingham: A Social History of Provincial Science and Industry in Eighteenth-Century England". Oxford: Clarendon Press. Uglow, Jenny (2002). The Lunar Men: Five Friends Whose Curiosity Changed the World. Faber & Faber. ISBN 0-374-19440-8. Goldthorp, W. O. (2009). "Medical Classics: An Account of the Foxglove and Some of its Medicinal Uses by William Withering, published 1785". Brit Med J. 338: b2189.